Forestside Farm, Marchington, staffs. Top quality campsite great views and with excellent showers etc. 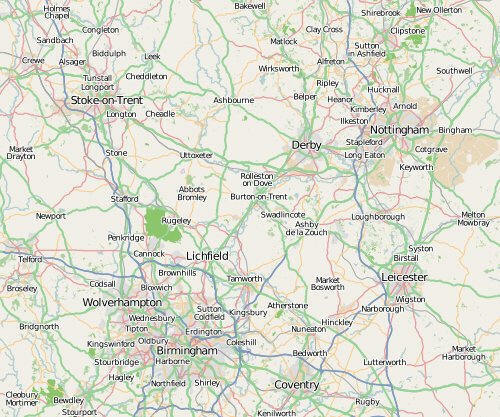 Some really pleasant walks across the fields (towards Marchington and 2 good Pubs - see map) or into the forest. Uttoxeter Caravan Club Site just a 15 minute walk to the town centre (as can be seen on the map). Lots of old buildings and history, good shopping and a good Weathrspoons - especially Tuesdays Steak night. mile flat pleasant route between Oakamoor and Denstone - pubs at both ends!!! Alton Camping and Caravanning Club Site - located nr Alton Towers, Staffordshire. A massive site, with excellent facilities close to a pub. The Roaches in Staffordshire on the Leek to Buxton road. Good walking and great views. If driving towards Leek look out for the Winking Man as you drive past the Roaches - a quirky feature in the rock formation. a great day out at the Churnett Valley Railway located just south of Leek in Staffordshire ......... well worth a visit. Luds Church nr Roaches End. 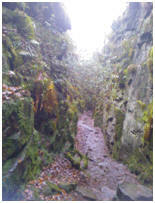 A wet walk setting off from GLADBACH up to ROACHES END and then back via the RIDGE and LUDS CHURCH. The city of Lichfield in Staffordshire which boasts an impressive cathedral, a good shopping centre and market. Plenty of good caravan and campsites nearby.